Our Annual Review of Real Estate sales in Wilderness Ranch & Boise County for 2013 and your 2014 forecast. At the start of 2013, Boise was named one of the top ten cities leading the national recovery by Forbes (as posted Feb 4th 2013), as well as one of the cities with the highest home price appreciation. But how did we fare throughout the year and where are we today, but more importantly, where will tomorrow take us? Year at A Glance: The first and second quarter of 2013 showed continued growth and sales in both Ada and Boise Counties. While prices leveled off and a sense of normality returned to the market place, the third quarter showed a decrease. This was mostly due to the government shut down and sequestration which added both uncertainty and increased interest mortgage loan rates by 1% to 1.25% . The end of the fourth quarter saw a small rebound. Average overall increase in value on a median priced home in 2013 was fairly similar for both Ada and Boise Counties, coming in at around 11%. 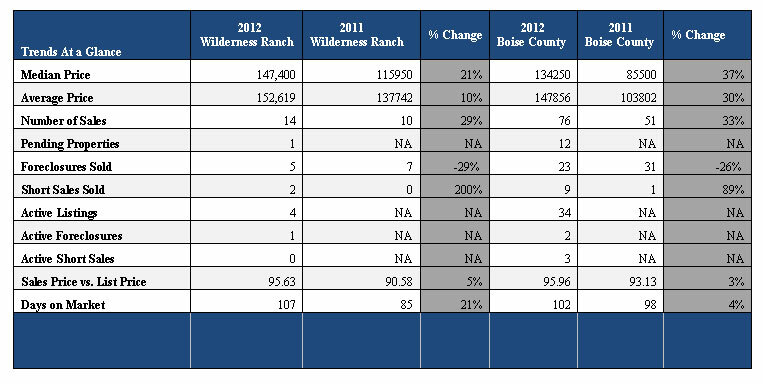 Boise County Trending and Sales compared to Wilderness Ranch Properties Detailed in Following Graphs. • 78 Units Sold in Boise County 2013 compared to 157 Units Listed about a 50% absorption rate. • However homes in the 250k and above range showed a much higher absorption rate. • Highest Sold Price per sq ft was $166.12 and lowest was $39.15. WR Comprised nearly a third of all the home sales in Boise County and on average continues to maintain a higher absorption rate and garner a higher sales price per square foot. The next closest neighborhood by comparison to WR would be Osprey, which generally sells at a higher price per sq ft. However it has a minimal amount of existing residences by contrast, hence therefore has a smaller turnover rate by proportion. • As many are aware, the Warm Springs has reopened. This has helped Boise County and especially the Idaho City economy and will continue to do so. • As the large mining operation in Placerville grows (as is anticipated) this will also have an impact on Idaho City, as workers will no doubt frequent Id City for goods and services as well as increase rental rates. • In addition, the new Medical Family Practice by Dr. Matthew Nelson known as ‘Mores Creek Family Medicine’ was a well needed addition to the county. The Federal Reserve has determined to decrease the ‘Quantitative Easing’, whereby the Government buys back its own bonds, which the rumor alone resulted in an interest rate hike of about 1% for mortgages in second half of 2013. When this does occur (and trust me it will eventually), then you can expect to see interest rates increase. As of end January 2014 the Feds have unanimously agreed to cut back from 70 billion to 60 Billion a decrease of about 10 billion. Depending on how this affects the market, and their continued endeavor to diminish the easing, we can potentially see mortgage rates go to 5 or 6% by end of year and in the next two years we can easily see 8%+. While this may be good overall for the US dollar in the long run and no doubt for people intending to live on interest from savings (because currently that is near zero) it will have a serious affect on real property sales for a period as it lowers buying power. Prediction: How will this affect or housing market in the year to come? Once people realize and accept that the trend on interest rates may be a steady climb upwards, I forecast that it will initially create a wave of buyers trying to beat the rising tide. Following that we will settle into a mental adjustment period where sales may go flat, and as laws of supply and demand go, can affect values. The duration period to pull out of something like that is difficult to predict at this point. You can liken the adjustment to gas prices. Remember the first time you paid $2 per gallon? We all had a fit, then we saw gas rise to nearly $5 per gallon. Now we would dance for a chance at $2. I get giddy when it drops down near $3. People will always want and need to buy or sell, and eventually they will accept and settle in to the current norm of the day. This spring may afford a window of opportunity. If you were considering making a move, upsizing or downsizing, then you may want to evaluate your options today. Please feel free to call or write us with questions. We are always happy to help with information or to answer any questions. 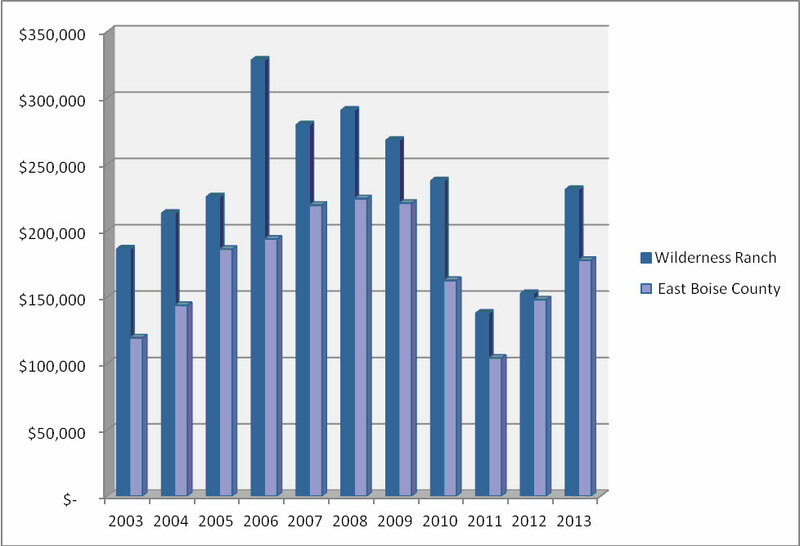 Our Annual Review of Real Estate sales in Wilderness Ranch for 2012 and your 2013 forecast. Wow what a year! While I had forecasted in last year’s report that we had passed the bell curve and would see an increase in market values for 2012, the market surpassed what anyone had expected or predicted. We saw an unprecedented turn around in the Treasure Valley real estate market. Overall values increased anywhere from 10% to 15%. These gains were primarily in homes under $350,000 but higher priced homes benefited also. What were the causes and effects? What we witnessed was a market correction. It showed that homes had become undervalued. I like to use the Circuit City analogy. ‘Best Buy won the war’, … however I would bet Circuit City had way more customers the last four months they were open during their ‘Going Out of Business Sale’. Best Buy had no way to compete with their prices those last months, but after their biggest competitor was finally gone, they knew they would see a spike in their growth and profit. Likewise, as the banks ‘Going Out of Business Sales’ (foreclosed homes) were nearing a completion, the average seller was not able to compete with these prices. We then entered a period of contraction. This simply means we had more buyers than available listed properties. Supply and demand rules ensued. With the low inventory of listings on the market, we often dealt with multiple bids in the Valley when homes were priced competitively. But how did Boise County and Wilderness Ranch fair in comparison? In 2012 East Boise County finally crossed an important barrier. For 18 months we had no sales over $230,000 and that was causing difficulty in appraisals. Not that the value wasn’t there in higher priced homes, just that appraisers couldn’t validate them for the lenders and the lenders need the appraisals to issue the loans. The New View Team was able to complete two high-end sales (Boise County, but not in WR) very early spring, (cash deals) that helped remove that barrier and set precedence for every other sale and refinance that occurred moving forward in 2012. 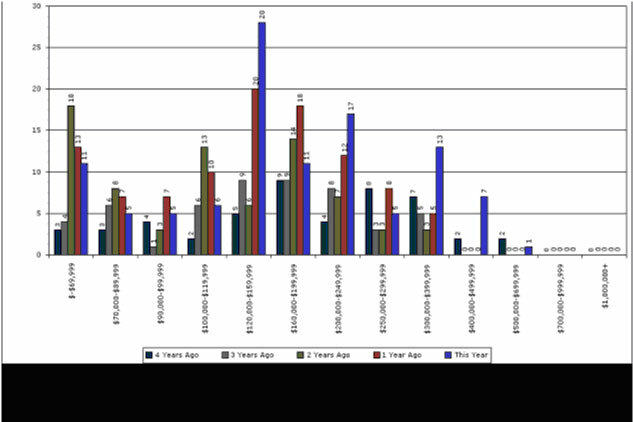 Boise County tends to lag behind the Boise Valley (Ada County) by six to twelve months typically. The Boise Valley saw a noticeable turn in the market starting the fourth quarter of 2011 so we anticipated it to carry over to Boise County by spring, but as summer set in it happened better than anyone had expected. No complaints here! Boise is still seeing a contraction as developers try to re-group and get approval on new parcels through the hoops of planning and zoning for building. I expect to see more homeowners (who were previously tight on the current value vs. what they owe) attempt to list in 2013, now that values have increased. Nationally, home prices are predicted to increase 1% to 3%, but I predict Treasure Valley real estate increases to be somewhere between 3% to 5% conservatively. In part, this projected increase will be due to a rebound in land values, which affects ‘over all’ home values. Boise County, I believe, will see the START of a land recovery in Spring of 2013. Whether it will do as good as housing did in 2012 is yet to be seen. If you are looking to invest, then NOW may be a good opportunity to consider land, prior to a potential rebound. I would suspect we will see more building and new construction homes taking place in Boise County in 2013. – The opening of the Hot Springs in Idaho City which will help this end of the county economically. – Dr Matt Nelson’s new Family Practice office, which will be located directly across from the old Rock’s Lodge. If you have any real estate related questions, please feel free to call or email us anytime, or visit our website! We would love to hear from you. 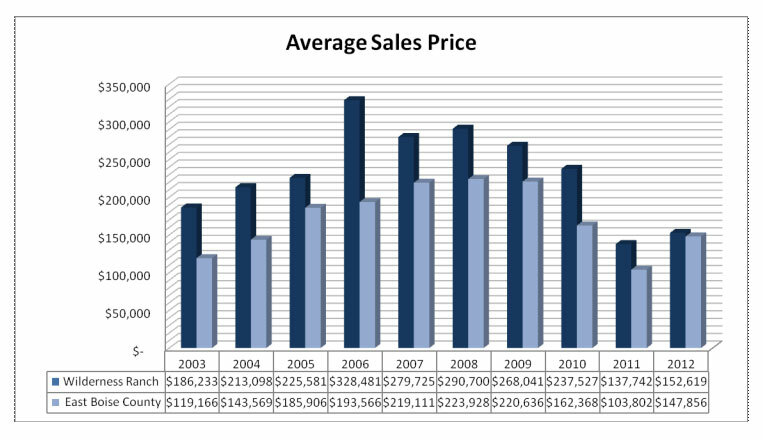 Annual review of real estate sales in Wilderness Ranch for 2011 and forecast for 2012. The city of Boise and the Treasure Valley area was a mixed bag. We actually saw a price increase of about 3% in homes under $150,000 mostly due to low interest rates, affordability and bank owned opportunities. Many were multiple bid situations. East Boise County always seems to lag the Valley in the curve. So how did Wilderness Ranch fair for 2011 in the real estate market. Sales and values were below average but considering the market and economic climate there were some pros and cons. For starters in 2011 there were no sales in all of East Boise County over $230,000 which was extremely uncommon. I expect that trend to break this spring. We had a total of 14 sales in Wilderness Ranch and two in Hidden Bowl, our close neighbors. Of which I was party to 11 of the transactions in Wilderness Ranch, four of which were land sales. I also moved two homes in Hidden Bowl off Daggett Creek. Land sales were dismal as most people were taking advantage of the competitive pre-owned homes market. There were a total of 22 Home listings in WR for 2011 with 10 home sales; that makes a 45% absorption rate from list to sale which is phenomenal when compared to the rest of E. Boise County. Our number of home listings were pretty average and much lower than the last three years as we have sold a lot of the excess inventory that was held over from the 2008 and 2009 market. East Boise County in all had 134 Home listings (not including WR) and 43 Home sales; which was basically a 32% absorption rate. So WR has consecutively outsold the County in general year over year. Proving that WR is a good place to buy with. I currently have four homes pending sale in WR, two are short sale and two are non distressed. Now for the nitty-gritty of it; Of those WR sales there were seven that were distressed property; i.e. bank owned and/or short sale. However I expect to see less distressed property in 2012 which I will cover in our forecast. 45% Absorption rate on homes sales (odds of your home selling) which was above the 2010 average. Lowest sales price per square foot was $41 per sq ft. The overall average was skewed by a few smaller lower quality and bank owned properties, but I would determine the average value of a well cared for home in WR at around $85 to $103 per sq foot depending on quality of finish, views, acreage and other amenities. The Federal Reserve has alluded that it will maintain its current interest rates through 2012. Which I had anticipated since they want everyone focused on the elections. As we all know we’re not out of the woods yet; but barring any unforeseen economic crises (holds breath) I do believe we are past the bell curve on the foreclosure market. We will yet see many more homes complete the foreclosure process and banks still have a back flow to list. However as the year progresses we should start to see a gradual decline. I suspect another 18 months before this market really becomes a part of our past. I don’t foresee too much activity in land sales for 2012, though it more than likely will be an improvement over the last two years. My anticipation is we will see a few more home listings this year than last year and as long as pricing is right and interest rates stay low, my goal is to increase our absorption rates by at least 10%. If you have not had a chance please visit http://www.wildernessranchhomes.com and if your on Facebook send us a like and feel free to post a comment or a picture. Do you dream of a Home in the Mountains, living amongst the trees, surrounded by the wonders of nature. All too often such locations are too remote for year around living. Look no farther, the Boise County area is a short drive to the city of Boise Idaho & offers the best of both worlds. Where as an everyday occurrence, the beauty of nature is right in your backyard. Boise County Homes offers a number of Subdivisions and communities to choose from. Some premier Subdivisions are Wilderness Ranch, Duquette Pines, Osprey Meadows, Elk Run, Elk Meadows, Timber Mountain & Robie Creek. Some of the communities are idaho City, Placerville, Centerville, & Clear Creek. Please contact Paul Heim for Boise County Home Information 208 344-5700. Contact Me Contact Your Boise Realtor! Idaho Mountain Living Learn about this beautiful mountain community! New Boise Real Estate Get the latest listings on the market! Relocating to Idaho? Need help making the move? Your Dream Home Find your dream home while you sleep ! My Facebook Join me on Facebook! Real Estate Blogs Directory Directory of real estate blogs and blogs of industries affiliated with and serving the real estate industry. The New View Team features Boise Idaho Real Estate. Serving the entire Treasure Valley of Southern Idaho. Put your own personal team to work on all your Real Estate needs. If you are needing to buy, or sell. Maybe relocating to the Boise area. Call or write today for assistance.